This watercolour by Thomas Baxter is both initialled and dated (‘TB’, ‘July 1818’) and bears its title ‘Green Hill’ in the bottom left-hand corner. It is difficult to imagine that this peaceful, rural scene is today near the hectic crossroads at Dyfatty, where Carmarthen Road and Neath Road intersect. In the foreground, the paths of two women, carrying their wares aloft, have apparently just crossed outside a public house, clearly signposted, ‘The Upper Lamb’. 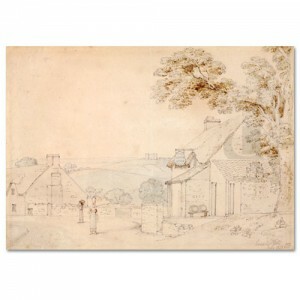 In the distance, beyond the fields where Landore and Brynhyfryd now stand, can be seen Morris Castle, built in 1773. The fortress-like appearance of this building belies its unique status as the first purpose-built block of flats for workers in Britain, the brain-child of industrialist, Sir John Morris. Two of its walls can still be seen silhouetted against Morriston’s skyline. Within a decade Greenhill had become a densely populated, built-up area where for a century overcrowding and disease took their toll on the workforce of the Lower Swansea Valley.